Welcome to Friday (I’m doing a little dance as I type I’m so happy it’s Friday)! I don’t know about you but I’m so looking forward to this weekend. Friday nights are my favorite, especially lately because they’ve been date night with the hubby. Usually we hit up a new or favorite spot, or cook up something a little more fancy, have a drink and watch the latest chick flick. I know I am insanely lucky to have him! Okay onto this weeks App Review. I didn’t get a chance to review a new one this week but I do have one that I use pretty regularly and is pretty simplistic. The Environmental Working Group puts out the dirty dozen and clean fifteen lists every year to help consumers make smart choices in order to reduce their pesticide intake. The intro also includes some information about “plus” foods that aren’t conventionally grown in the US and GMO’s. 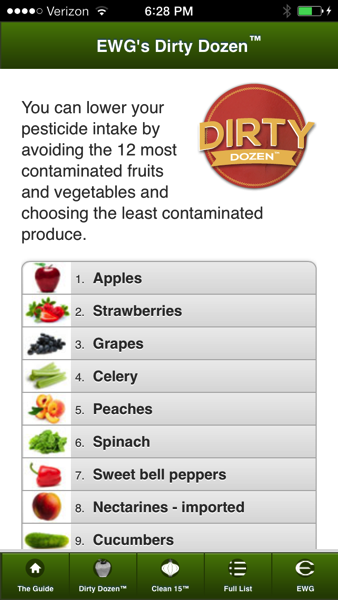 The idea is to purchase the top 12 most contaminated produce (the dirty dozen) organic to lower your overall intake of pesticide residue. 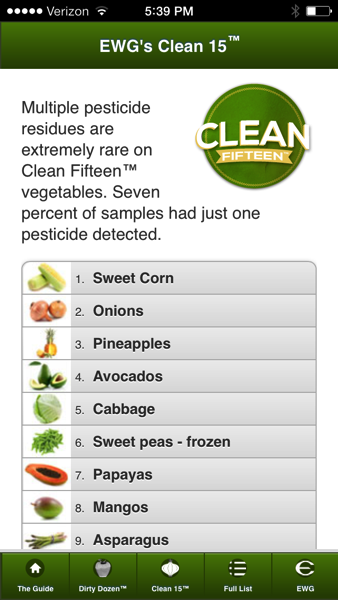 The clean 15 list lets you breath easy when buying these foods non organic. I can’t afford to buy all my food organic, nor do I think its necessary. I love this App for helping me to decide which produce items I get the most benefit from forking out a little extra dough for organic. The app is extremely user friendly, very simple, and free. It allows you to quickly open and browse the list when shopping at the store so you can make fast decisions. To date there isn’t any good scientific evidence that organic is better for you than non organic. The app (nor does the list) specify variations in produce (like a gala apple vs. fuji). 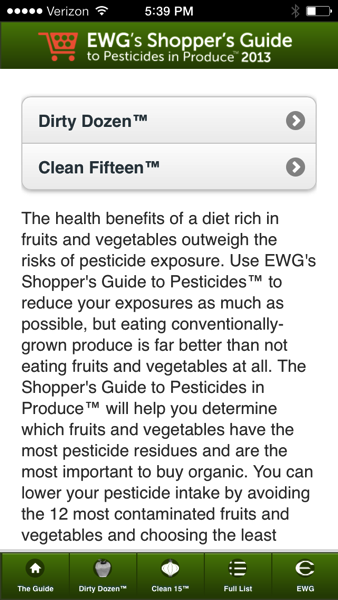 I think this App is a great quick reference guide for anyone that is interested in lowering their exposure to pesticides and not break the bank in the produce section. Happy shopping & Happy Friday! I just ran across your blog! So good!